Perhaps you are an old pro at crafting handmade wool beads or you might be a curious new beginner to the world of feltmaking. Either way, here you'll find my personal tips and links to a few excellent photo tutorials online. First start with my article below to give you an idea of how the process works. It covers information about making both round and rolled (or sushi style) felted wool beads. 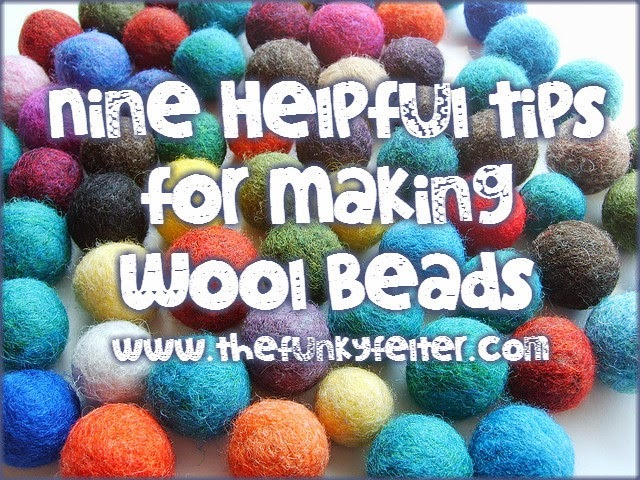 Click here for my 9 best crafting tips on felting beads. Below you'll find a simple list of things you'll need to wet and/or needle felt so gather those up. Then visit some of the tutorial resource links and get started crafting your own woolly balls. Here's an alternative method using pantyhose and your washing machine by Handmade Felt Toys. I've made all sizes of felt balls many times using this technique. To get a more uniform shape, I needle felt them first into a loose round shape, then insert them into the hose and tie them tightly in place. This method doesn't always get the most perfect shaped result so be forewarned. It is a great way to make many, many felt beads in bulk quantities though. Also, I wanted to mention that the wet felting technique for making wool balls is a great project for kids too. To make it even easier for very small children, use some pantyhose to insert the wound wool roving as in the washing machine method above and let them felt with their hands instead. Felt balls make great little animals when sewn together that the kids can decorate. Check out this adorable catepillar by JulietK as an inspirational example. If you are at a loss as to what to make with your newly made beads, check out my flickr photo gallery for some ideas. Happy Felting! Do have some sweet tips of your own or questions about the process? Please share in the comments or get in touch with me directly.